My sweet nephew turns nine today. NINE! How can that be?! I swear that I changed his first diaper LAST WEEK. As of today, he’s half way to being a grown-up. I am now going to cry in my coffee…. While I do that…you should make these. 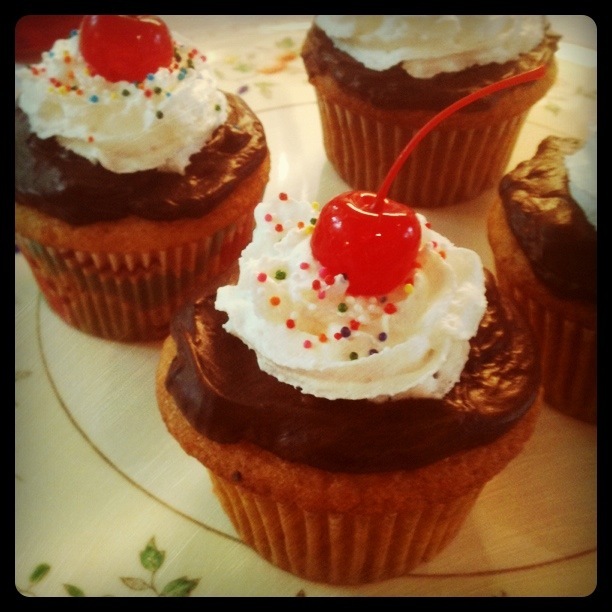 They are vanilla cupcakes, with chocolate ganache, and whipped cream topping. Originally created by my favorite baker, Joy, they are adorable and delicious all in one. I made them for my half-way-to-grown-up nephew yesterday, who proceeded to scarf down the cherry, clean up the whipped topping, and demolish the cupcake. He left the ganache for me. I love that kid. HAPPY BIRTHDAY, LITTLE MAN! Love you to the moon and back…. Very sweet (literally). I need an excuse to make these!